As an elementary school teacher, you may want to take your students outside to play occasionally when the weather allows. This will help them burn off energy, and also may help them function better in the classroom, according to the Franklin Institute. 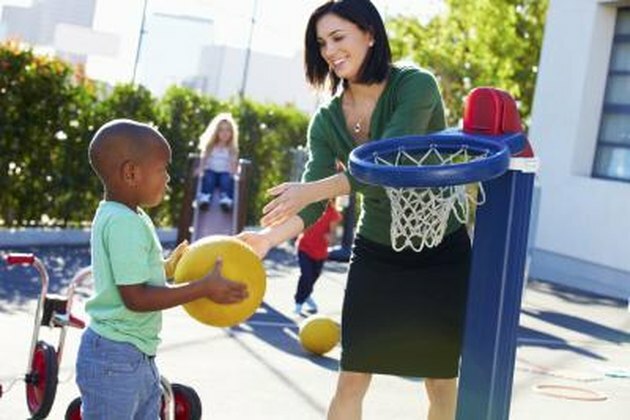 Teach your students enjoyable games to play outdoors so everyone has fun and feels included. You can even play along with the students to show them a side of you they don't often get to see! Your students will get plenty of exercise and have a lot of fun while playing the big foot relay game. Have each of them bring two empty shoe boxes to school. Tape the box and lid together and cut a slit in the lid. Divide your students into equal teams of three to five, and have each team line up on the starting line about five yards apart. Have them take off their shoes and put each foot into a box through the slit. On your command, the first player on each team runs 10 yards, around a cone, and back to her line. Then the second player in each line goes, followed by the third player, and so on until all the players have had a turn. The first team to have all its players complete their turns wins the game. The game of 500 teaches kids how to catch and throw, and improves their hand-eye coordination. It is appropriate for older elementary students. Pick one student to start as the thrower, and have the other students stand in a group about 20 to 30 yards away from the thrower. The thrower calls out a point value between 50 and 500, in multiples of 50 only, and then throws a softball up in the air toward the group. Whoever catches the ball receives the points. The first player to accumulate 500 points wins the game and becomes the next thrower. If you have a big class, divide your kids into two or three groups and organize several games at once. There is a chance two or more students will collide when going after the ball, so make sure they aren't too aggressive. Sit out any students who are playing too rough. Kick the can resembles the games hide-and-seek and tag. Place a can on the ground and have one student, the "counter," count slowly to 50 while standing by the can. Tell the other students, the "hiders," to scatter and find a hiding place. When the counter finishes, he yells "Ready or not, here I come" and moves away from the can, looking for the hiders. When he finds another student, they race back to the can. If the hider kicks the can before the counter tags her, she is safe and becomes the next counter. If the counter tags the hider first, the hider sits down, and the counter looks for another student. The game continues until one of the hiders knocks over the can or the counter tags all the hiders.